Could three days of summer happen to be real in the middle of winter? Welcome to Kalamata! Could three days of nature, sun, food, innovation and friendship happen to come together? 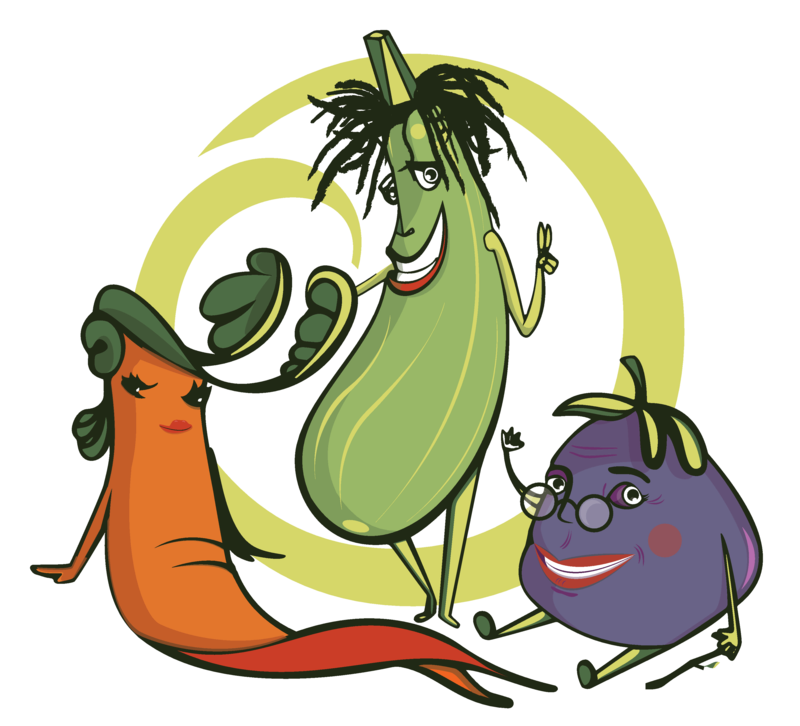 Welcome to the workshop of Food Connects People!!! We, participants from Italy, Turkey, Greece and Germany came together at the workshop of Food Connects People in Greece, Kalamata on 8th -11th December 2016. Many of us met at the airport in Athens and rented a car as a group to drive to Kalamata. Everyone was there for friendship, food, curiosity and fun! Sharing the same purpose, we were on the way to Kalamata under a nice moon with lots of laughter starting from the first moment. 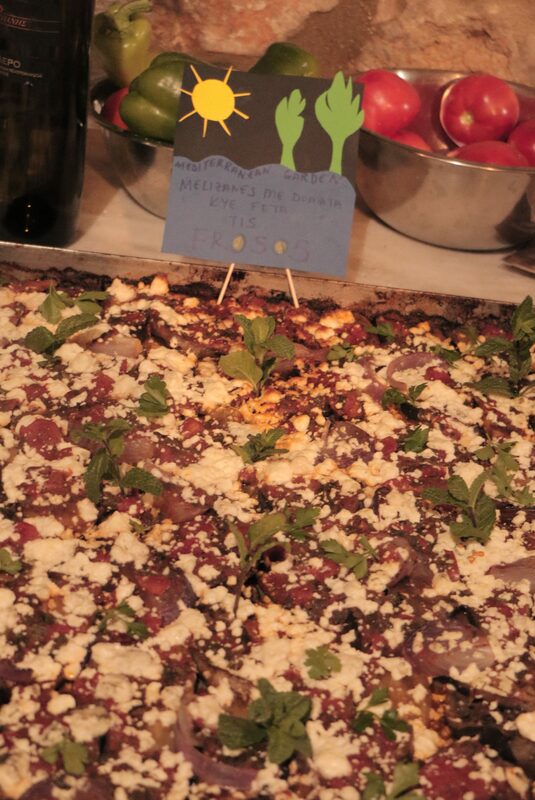 When we all arrived and gathered together in the Villa Avia, greek wine and feta cheese were waiting for us to warm up and get to know each other in the middle of blue and green colours of the nature! If you have a chance, you should definitely give a try to the red wine “Agiorgitiko Nemea” and the white wine “Moschofilero”. On 9th December, we all woke up to a fresh and warm morning. After breakfast, we first visited a close Greek village called “Malta” where we enjoyed taking photos, speaking to local people, visiting a small olive oil mill and even trying some virgin olive oil which was produced in front of us couple of minutes ago! The mill was one of the oldest in the region, from 1765, still serving lots of local olive oil producers. It was not over just by tasting freshly squeezed olive oil, we also had a chance to see the olive harvest. The weather was like a spring day, we were all far away from the noise of the city, witnessing the people picking olives from the trees under an unbelievable warm sun in December. 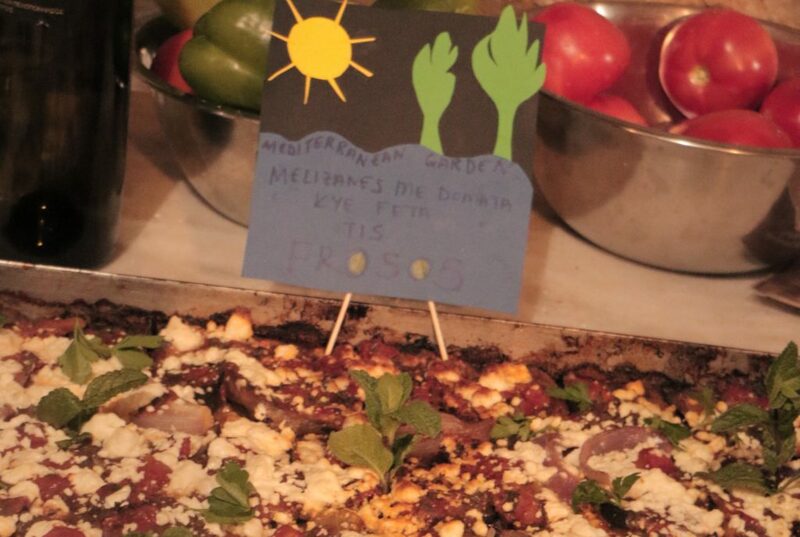 The idea for the first part of the cooking workshop was to bring a childhood recipe and cook it in Kalamata with Greek ingredients. So in the afternoon, coming from different cultures and backgrounds, we, participants, were all excited to go to the local shops and enjoy to explore the ingredients that could fit to our childhood recipe! We were scattered around, having great fun to find out the most similar cheese, spice or vegetable we could to make our recipe the most similar to the one that we remember from our childhood. This would definitely be a creative combination of old memories with the new Greek adventures! We were back to our houses and started cooking in groups. At the end of three hours a colorful table full of nicely decorated dishes were waiting for us. 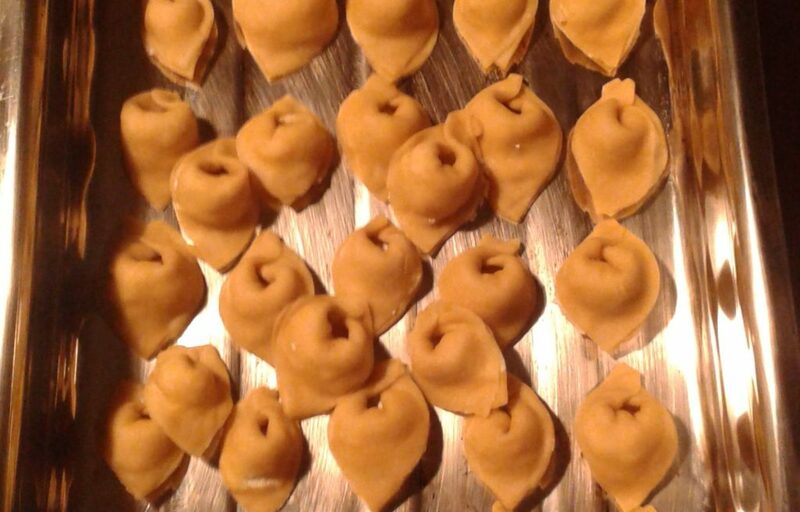 “Cappelletti romagnoli”, “Gnocchi al ragu”, “Risotto al teroldego” were among Italian dishes which were adapted to Greek ingredients. There were many Turkish plates, too. “Biber dolması”, “Mercimek köftesi”, “Sıkma”, “Börülceli tarhana çorbası”… We all enjoyed trying them one by one but before we started eating we voted for the most beautiful dish and in the end we voted for the most delicious one. 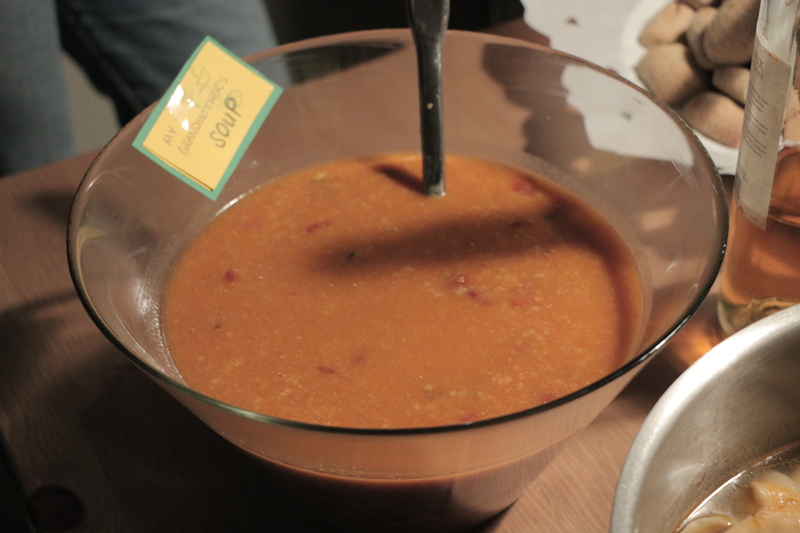 The winning dish for the taste was from South Black Forest of Germany originally called “Karamellisierte Petersilienwurzeln”, the workshop version called “Karamellata stin Kalamata” (it means “caramelized in Kalamata”). 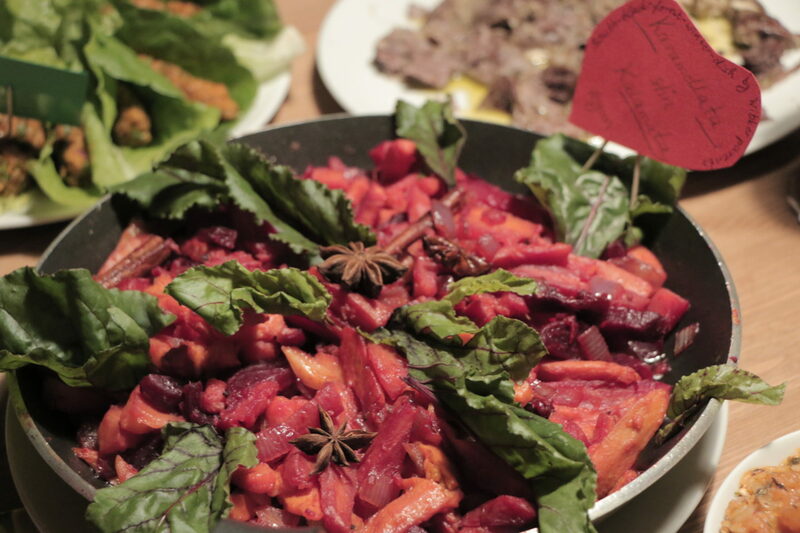 It was a tasty dish cooked by winter vegetables such as beet roots, carrots and sweet potatoes and scented with star anise and cinnamon sticks. The evening ended with celebrations dancing with Greek, Italian and Turkish music! The second day started with the smile of a generous Greek sun as well! We went to visit the close village named “Kardamyli” where we could see the wonderful landscape which was a combination of nature and history! The weather was so nice that some of us went to swim in the sea, too! 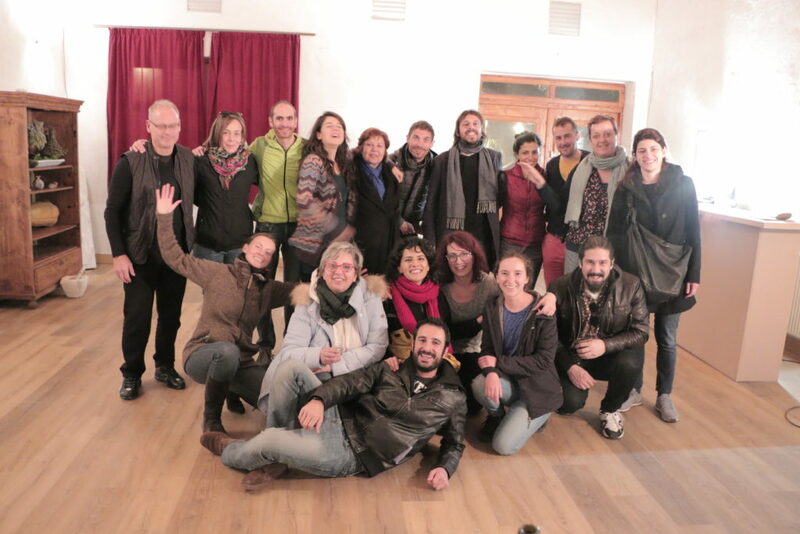 As I mentioned at the beginning, this workshop was a short escape in the middle of winter; where sun, a piece of summer and youthfulness came to life with the energy of friendship, food and creativity! 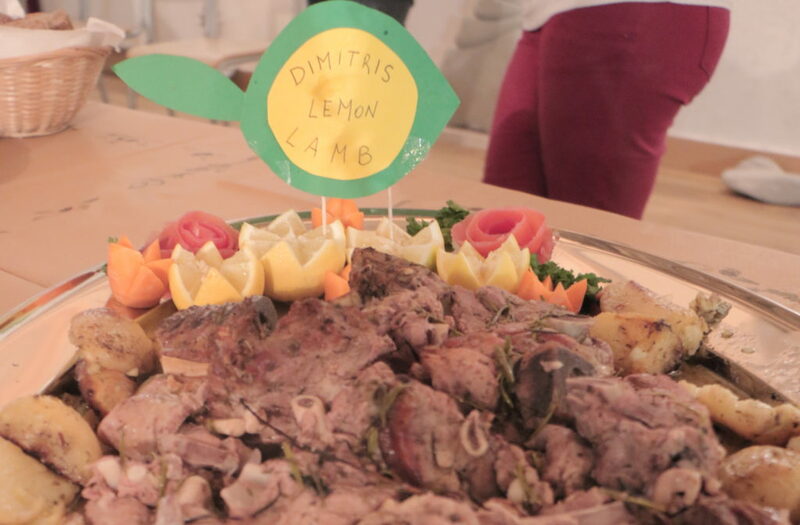 The idea for the second day was to cook a Greek recipe which the participants would learn by interviewing local people. So, this time, we were on the streets of Kalamata, feeling half tourist, half local already, and were trying to learn from people to cook the best local Greek food! This was a great fun, as the Greek people were very warm and interested in teaching us -an interesting, enthusiastic and international group- how to cook local Greek recipes! The surprise of the day for us was to cook in a different place, not the Villa Avia, instead another wonderful place called The Art Farm. We enjoyed drinking our tsipouro (it’s a local drink like Italian grappa) and watching the sun set and the sea before starting to cook! Meeting Sotiris who was the owner of the Art Farm, and hospitable local people was a great memory! We started cooking using the wood ovens and Ana, together with Nikos, cooked for us “Spanakotiro Pita” (it is a salty pastry like Turkish “börek”). All night was fun, people meeting, drinking, dancing together as well as tasting and enjoying the best Greek food on a long, big table! 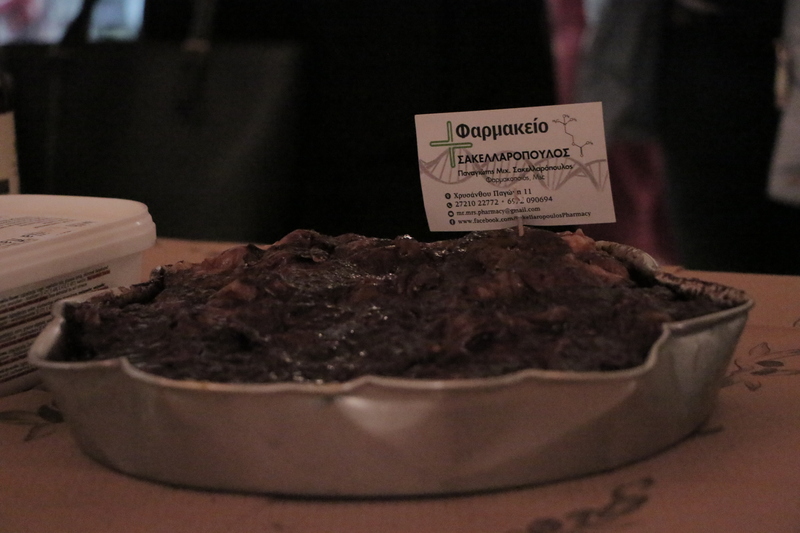 This time the winning plate was “Portokalopita” (an orange pie with dark chocolate cream on top). Despite all the difficulties, which Yasemin and Lavinia had, to cook the dessert (the electric oven was too small and they didn’t find the right tray small enough, so by the help of the Greek friends they re-shaped a round tray so that it could fit in! 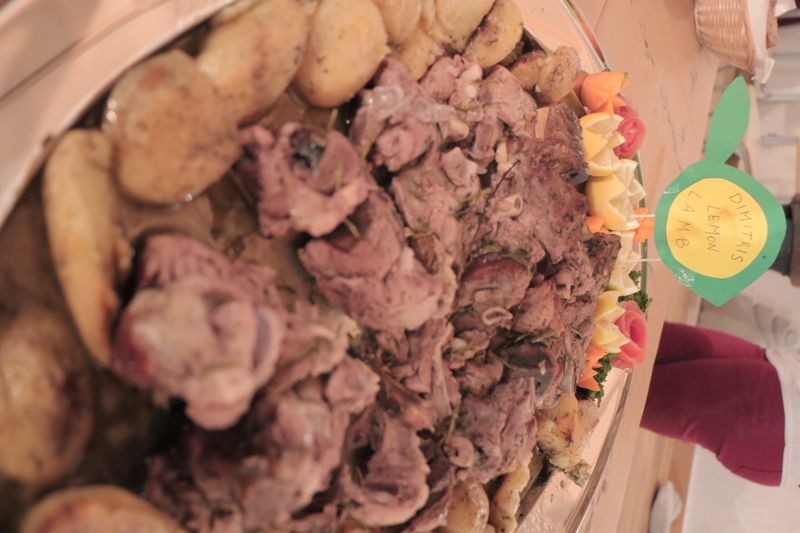 ), it came out fabulous, the taste was confirmed by the local participants, too! So we were good students. We learned well how to cook local dishes and we passed the exam. 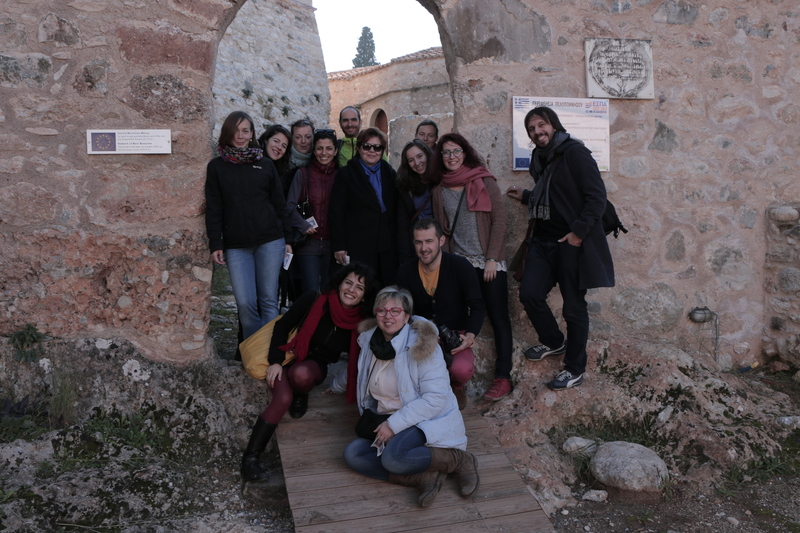 A bunch of smiling foodies in Kardamyli Village where “Before Midnight” was filmed. 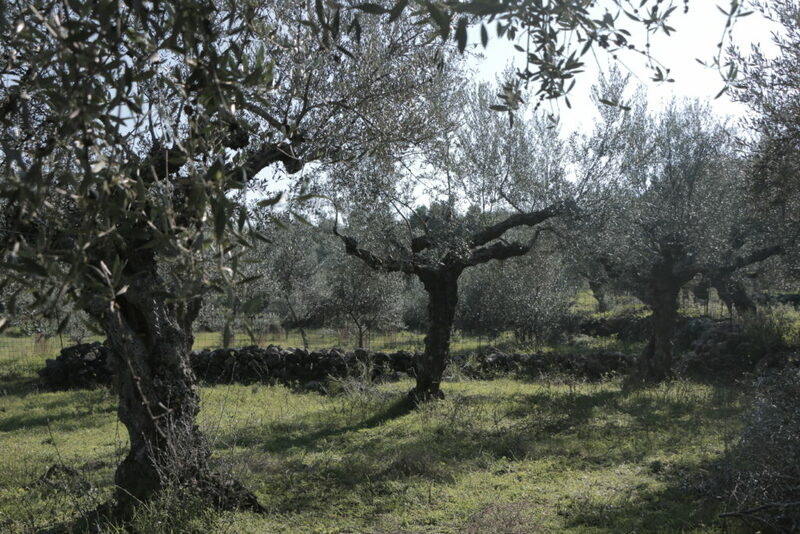 Beautiful olive trees of Messinia. Sun, silence and peace. Last night in Kalamata. Good bye lovely lands, lovely people. We will miss you!